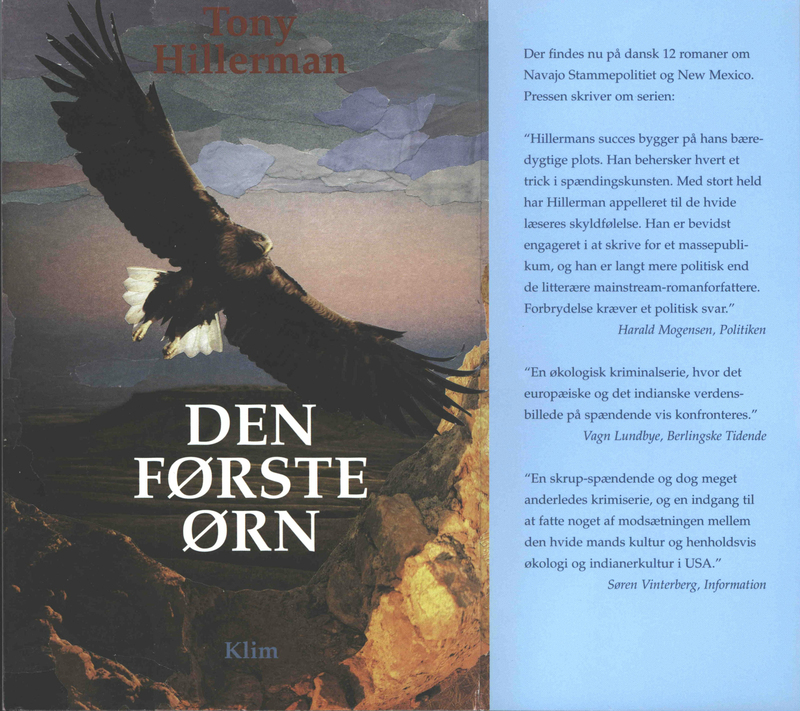 This is the Danish edition of Tony Hillerman's novel The First Eagle. Translated from English by Søren Barsøe, it was published by Klim in Aarhus, Denmark in 1999. The cover is by Nils-Ole Lund and features a collage of an eagle soaring above sunlit rocks with a large mesa beneath a lavender and grey sky in the background. The back cover background is an opacified two-color version of the eagle figure in purplish-gray on a pale blue background. A synopsis is printed over this background in black. The bar code is at the bottom right of the back cover. The paper cover has flaps. The front flap contains praise quotes for the novel. The back flap displays a photograph of Tony Hillerman and a brief biography. The author's name, novel title, and publisher name are printed on the spine.